It’s hard to believe we’re already two month into 2016, but we are! With the temperature a chilly 86 degrees outside, it’s definitely wintertime here in Southern California, as El Nino plows into us with wave after wave of devastating storms. At this rate, we may never see summer. It’s a good thing we have each other to raise our spirits and keep each other warm and safe inside the Hidden Village at Don the Beachcomber as our mixers continue in this new year! 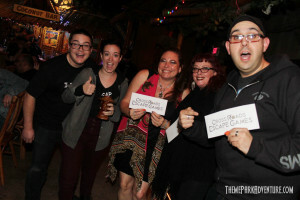 On the evening of Sunday, January 17th, more than 100 theme park fans and haunt enthusiasts gathered at the famous tiki restaurant in Huntington Beach to kick off our Winter Nights at Don’s 2016 gatherings! It was tremendous to see everyone come together after the holidays, and ring in the new year together with potent tropical cocktails and exotic (okay, not so exotic) eats and treats! Halloween 2015 is well in our rear view mirror now, and some of you are experiencing major haunt withdrawals. Reign of Terror in Thousand Oaks is here to help – and in turn, you have an opportunity to make a difference for kids in need through Make-A-Wish Tri-Counties. 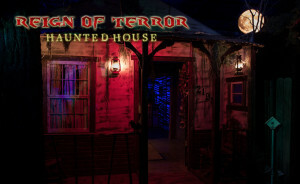 Reign of Terror is one of the largest and most visually-stunning haunted attractions on the West Coast, and has long been a charitable contributor to multiple causes here in the Southland, where so many haunters and fans live, work, and play. Having this attraction open during the year on special occasions is a fantastic opportunity for enthusiasts and fellow haunters that may not have the chance to check it out during the Halloween season to come out and join in the fun for a few ghoulish hours. Ripley’s Believe It or Not! 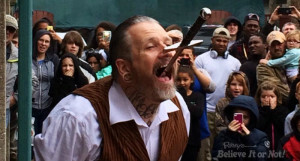 will pay tribute to the ancient art of sword swallowing by holding free sword swallowing performances as part of World Sword Swallower’s Day on Saturday, February 27. Two things to remember – that’s solid steel and yes, it’s all real. Ripley’s will showcase the greatest group of sword swallowers ever assembled and offer free performances for the public at 18 of its Odditoriums around the world – New York City, London, Hollywood, San Francisco, Orlando, Baltimore, Copenhagen, Grand Prairie, Atlantic City, Branson, Gatlinburg, Key West, Myrtle Beach, Panama City Beach, St. Augustine, Wisconsin Dells, Williamsburg and Surfers Paradise. With such a vague description, most wouldn’t quite understand what type of attraction this is. I was fortunate enough to experience Screenshot Productions’ first show last October called Fear is What We Learned Here. It was unique, surreal, dream-like and completely mysterious. From what everyone thought would be another 18+, “sign this waiver” and “walk through alone” type of haunt, it wasn’t really that at all. I was really impressed by how professional and different the approach was, and was already immediately looking forward to their next production. It wasn’t a haunt. “Boo” scares didn’t exist there. Fear Is What We Learned Here’s intent was to play with your mind (and scare it) – not just physically. 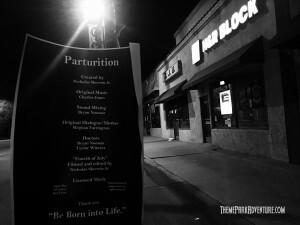 I had a sense of what to expect once I received information on Parturition, but this time it wasn’t about fear… it was about my birth. 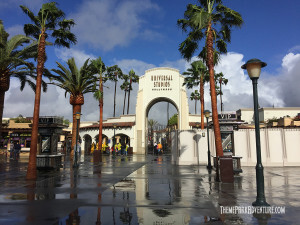 Universal Studios Hollywood is currently undergoing its biggest physical transformation ever, in preparation for the April 7, 2016 opening of the Wizarding World of Harry Potter. Everywhere you look, there is major construction underway, from the brand-new E.T. Parking structure, to finishing touches being put on Hogsmeade as we speak. With an April hard open date announced, fans are expecting that we could have soft open (industry term for “preview”) dates as soon as mid-February. In short, it’s about to get real here in Los Angeles, and all eyes are on Universal. We made our way up the hill to Universal Studios this past weekend and braved the rain and blustery weather conditions to see what we could see and bring TPAers a brief update – quite honestly, possibly the final update regarding Potter before we actually get to experience it, if the soft open rumors are true.